Our Eco-Safe Roof Cleaning service is what we’re most known for on Cape Cod. We understand roof cleaning, its deterioration, causes and cures as well as how to keep a roof clean forever. We use quality chemicals, equipment and techniques blended with professional workmanship and techniques to raise property values by bringing Street Appeal to your roof and helping you avoid the costly repairs (like replacement) associated with mold, moss, algae, lichen and more. We take a conscientious approach for the long-term quality and health of your home and landscaping with Eco-Safe cleaning solutions. If you are afraid of spraying a chemical up on your roof you should be. Not only can the chemical run off and damage your plants and lawn but some roof cleaning products sold online can be fatal to your pets. These toxic chemicals can alter the color of your roof and stain any other surface it may contact on the way off the roof. Our roof cleaner is made from earth friendly hydrogen peroxide and it will not harm people, pets or property. As an oxygen based cleaner, our cleaner only has an active life of 4-6 short hours before this product biodegrades, making it by far the safest method in the roof cleaning industry. We take immense pride in our work and we don’t clean from the ground. Most home owners do not have the capability of cleaning their roof the way a contractor would but there is always a natural concern from the home owner. A pressure wand in inexperienced hands can cause serious problems to a roof. With over 11 years of cleaning 2,500 + homes on Cape Cod, we believe we deliver the best quality and longest lasting “clean” available. We clean from the roof -not ground- using light pressure aiming down the roof at all times at the angle of the roof and using special nozzles for pressure washers that we manufacture called “Soft Tips”. We’ve customized that technique to reduce the impact pressure on a roof by up to 70%. 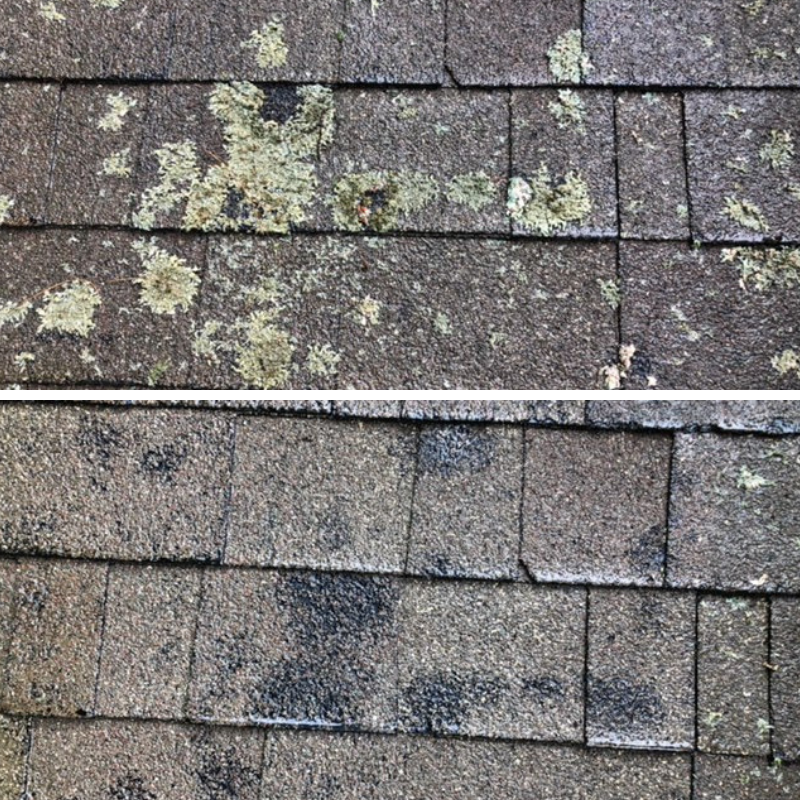 When a roof is professionally cleaned this way, no damage occurs to the roof. If you think you’re at the point where you can avoid replacing the roof but are putting the project off, you might be at risk of your roof being aesthetically altered forever with ugly black marks. These marks are caused by lichen and moss that has eaten into the shingle to get at the limestone. You can salvage the appearance of your roof by dealing with the problem sooner rather than later. Call Street Appeal Pros before it’s too late.